How to Mend a Hole with a Knitted Patch. Knitting sweaters, cardigans and other tops in one piece from the neckline down enables you to try the garment on as you go. This means you can easily adjust the fit. It also means no seaming at the end. Sewing seams is one of the jobs that many knitters hate, so this is a real plus. It's also a great way to start designing your own knitting patterns as you can change the design as you go. See our Top Down Knitting Book Reviews for details of the best books of seamless knitting patterns as well as books to unleash the knitting pattern designer in you! A great book to get you started is Fitted Knits by Stefanie Japel. It has a range of top down raglan tops, sweaters and cardigans that are modern and stylish. It also has notes on how to adjust the patterns for your body shape. These are usually the first type of top down knits that most knitters attempt. Be sure to check your row gauge / tension. If it is off then you won't get a good fit on the yoke of the garment. If your pattern has decorative eyelets at the raglan 'seams' then be aware that stitch markers on the needles will slide under the yarn overs. It may be better to use a split ring stitch marker in the central K1 stitch, moving it up as your work grows. Top down raglans that have paired yarn over increases at the raglan can be tricky to fix if you forgot a yarn over or a pair of yarn overs a few rows below. This type of raglan has a yo, K1, yo stitch pattern at the raglan 'seams'. Below are diagrams that show how to fix the problem so the decorative eyelet pattern is maintained. 1. Work with the right side facing you. 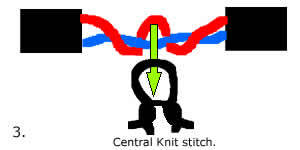 Drop the central knit stitch down to below where you have missed the yo. You will be left with a ladder of yarn above the central knit stitch. Straighten out the strands so you can see where they start. Work on the 2 strands directly above the central knit stitch. Pull the upper strand down over the lower strand. 2. Then bring the upper strand back up behind the lower strand. 3. Finally, use a crochet hook to pull the upper strand through the central knit stitch from the back to front of the work. 4. Repeat this process on every pair of strands above. 5. Check your stitch counts for each section of the knitting. You may need to increase a stitch or 2 to get the stitch count correct. Be one of the first to get Knitting Brain's latest OFFERS, DEALS and UPDATES. ©2019 KnittingBrain.com No part of the content (text or images) may be reproduced in whole or in part without permission. We will pursue all cases of copyright infringement to the full extent of the law and recover quantifiable losses.